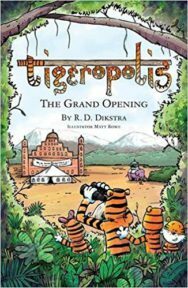 The Grand Opening picks up the story at the end of Tigeropolis: Beyond the Deep Forest. As usual Bittu and his sister Matti are full of enthusiasm for the task of making Tigeropolis the top tourist destination in India. Needless to say, things are a bit more complicated than they at first seem, and it appears that the Maharaja has some old scores to settle.